Have a seat, and we'll chat. Well, most of us wouldn't fit in one of those chairs, even though Mandy and Vroni found a few friends who would. We can't use the fourth chair right now, because there isn't room enough on the sewing machine cabinet to use all four. The girls are using a napkin made from quilting fabric as a tablecloth until I get one made for them. You may remember I found this item in the pile of stuff to give to charity and realized it might make a good table base. I believe it was supposed to hold fruit. I've had it a long time and have used it to hold various things over the years. I finished making the leggings I had cut out last week. I need to get a photo of the two girls together in their matching leggings. I'm still waiting to hear how and where Lilli & Fleur Couture patterns are going to be available, but watch this space. Or read Andrea's blog. I finished the Gracie Cardigan for Vroni. 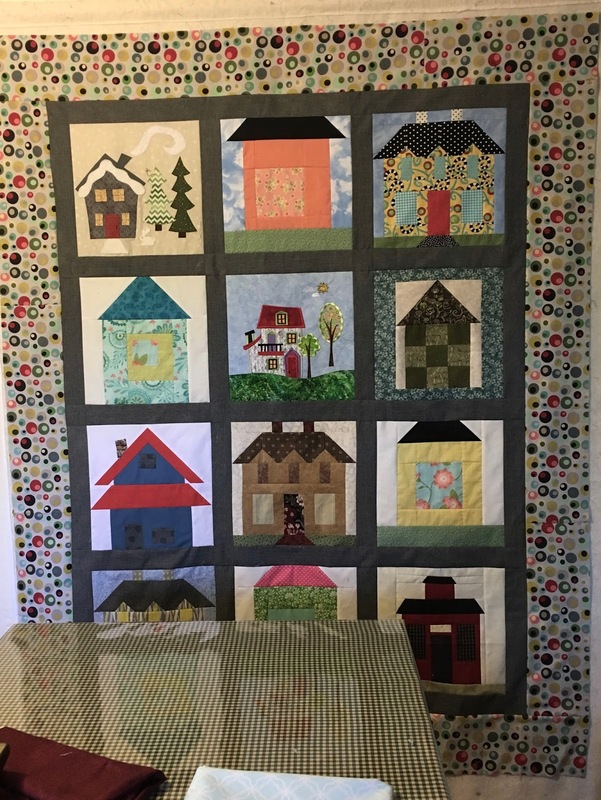 Other business this week was putting the borders on the new Habitat for Humanity quilt for the silent auction. It's at Julie's place at Bear Lake getting quilted. I'll get a photo to show when it comes back. There was a nice article in the local paper about the dolls for the silent auction. In the meantime, the wardrobe for the doll for Therapy Animals of Utah is coming together. Here's the latest outfit. I used the tennis dress pattern in Fancywork and Fashion's Best Doll Clothes Book by Joan Hinds. I like that it has a high neckline, as Zoey has a rather crepey neck where the fabric body meets the vinyl neck. The leggings she's wearing were part of her "meet" outfit (what she was wearing when she was...um...sold). She still needs a nice coat to go with the yellow fleece scarf and hat set I made her. She could use a few more items as well. I have until October 28th to finish, so I'm spreading it out a bit. Some people from Therapy Animals of Utah work with Best Friends Animal Society, and they're down in Texas now, helping take care of dogs and cats that have been rescued and helping reunite them with their human family members. When we use our Walk for a Dog app as we walk or hike with our dogs, it raises money for Best Friends. Both are worthy organizations. Thursday was a busy day (as it usually is). Common Threads met at Lynda's. Susan, who only lives here part time, was here because of the danger from Hurricane Irma to the part of Florida where she lives most of the year. She's a prolific weaver. She had just finished a set of these placemats. Lynda was still working on her "Come Fly With Me" shawl. I was working on my "Sistine Chapel" quilt. It's coming along, but I need to quit making things for charity and playing with dolls if I want to get it done. Later on Thursday, the representative from Costco who sold us our window shades a few weeks ago came to install all except the ones that go over the sliding glass doors. 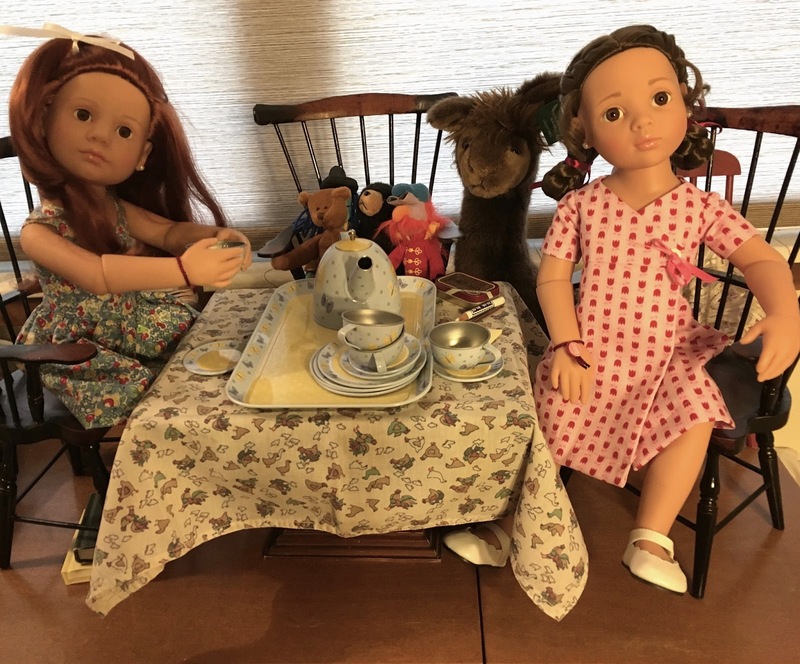 You've seen a bit of them in the photos of the dolls at the table, but here's a better look. We spent most of Wednesday moving things away from the windows, so he could get to them for installation. That meant moving the cabinet my cutting/light table is on. I vowed that I would not put anything back into it until I had gone through and culled what was there. 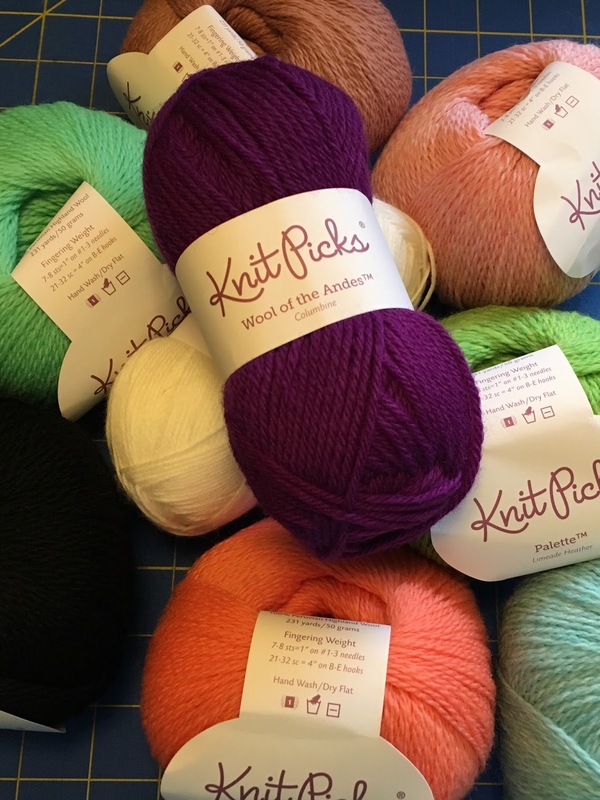 That got me started on the rest of my fiber studio, which has to be done anyway before our move next summer. I had to tidy up so I could work, but I still have lots of stuff I can stand to part with. This was how it looked the first day. This was the "good" stuff left in the hall at the end of the second day. It doubled over the first day, and that doesn't count all the curtains we took down. They will go into the pile after washing. I have to leave room to walk in the hall, so I had to stop. I had about an equivalent amount of recycling and trash. While all this was going on, the dogs had their regular grooming appointment. They came home looking spiffy. Finally, speeders have been scaring children and running over pets in our neighborhood for as long as we've been here. 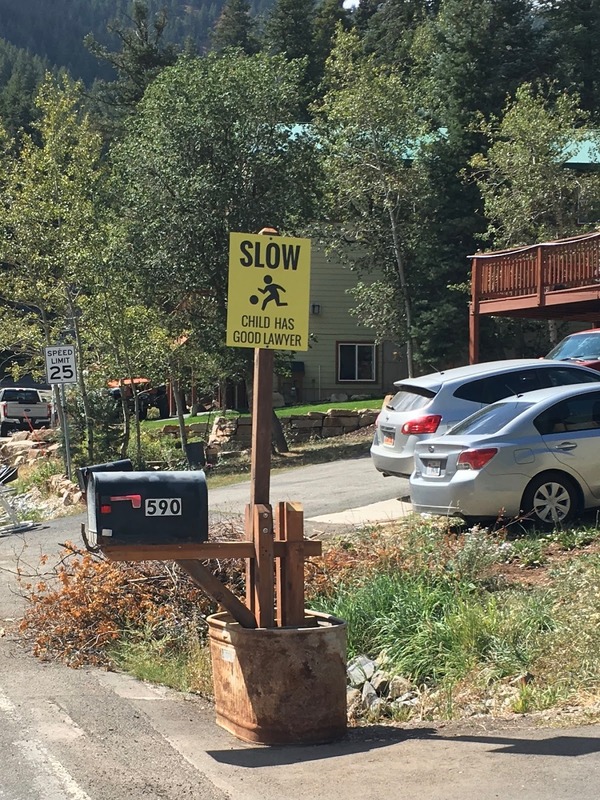 Warnings from the sheriff's office didn't work any better than the speed-limit signs. People put out those little green men and children even made signs with their own childish decorations on them. Nothing has worked so far. I spotted this the other day. I wonder if this will work? What's on my Featherweight: Still clothes for the Therapy Animals of Utah doll, but test-sewing for Lilli & Fleur Couture is finished for now. What's on my loom: Still waiting. What's on my wheel: Stanzi is now awaiting her next task. What's on my iPad/iPhone: Still listening to Emma by Alexander McCall Smith, being a modern-day retelling of Jane Austen’s classic novel. No progress on Amy Corwin’s novel All She Loves on the Kindle app. What's in my wine glass: Trader Joe's Charles Shaw (Two-buck Chuck) Shiraz. One of our favorites, although we have to smuggle it into the state when we come back from trips. What's my tip of the week: A freezer bag or ice chest will keep food hot for a long time while transporting a casserole to a potluck event. Just be sure you keep it flat during transport, and use a towel or other insulation to keep the hot dish from melting a plastic liner, if you use a bag. 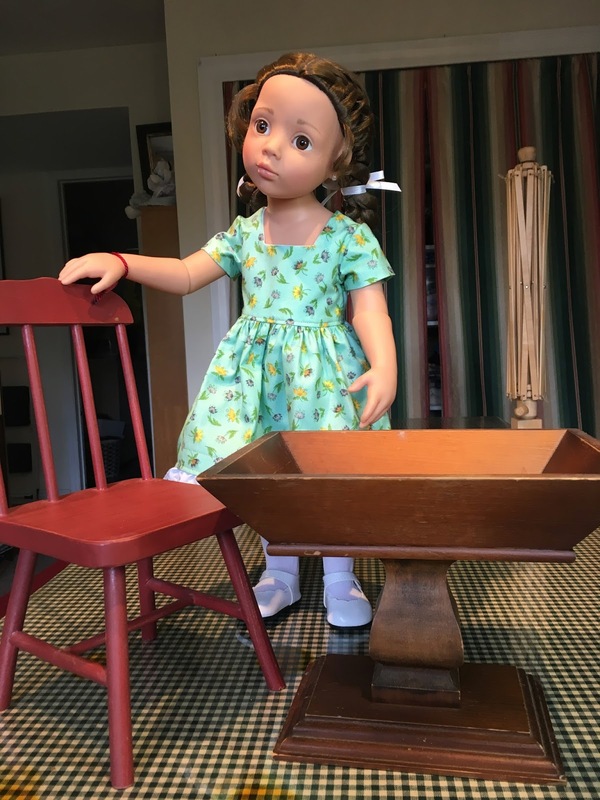 She isn't too young for the cloth-bodied dolls, but a perfectly nice doll from Madame Alexander would suit, or the Bitty Baby from American Girl. We started our granddaughter out at three with the Bitty Twins. She still loves them. 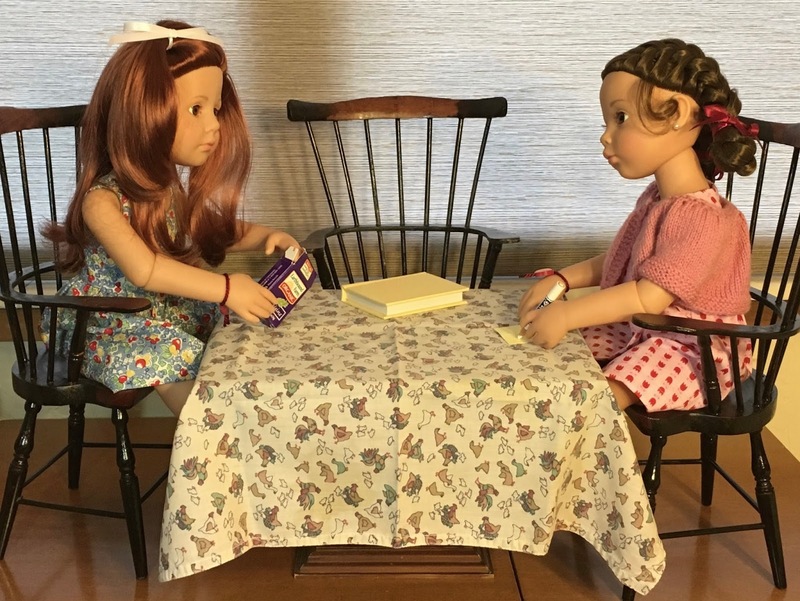 Thanks for posting the links Peggy - I've bookmarked My Doll Best Friend so that I can order from them when the time comes. Sophia is just turning 3 so she's really too young for a Gotz doll, but in a couple of years I'll give her one. In the meantime, I should start getting it all together - first the doll, then the clothes. There really are some beautiful dolls out there. Muriel, the dolls I dress are toy dolls. They are safe for ages 3 and up, but the Gotz Happy Kidz/Classic Kidz dolls are a little difficult to pose for children younger than 6-7 years. Gotz Precious Day dolls have the cloth body, and are suitable for any child age three and up. The Hannah dolls have vinyl bodies, but the only joints are neck, shoulders and hips. One leg is slightly bent, which makes them look more natural than most all-vinyl dolls. The Happy Kidz/Classic Kidz also bend at the elbows and knees. The Gotz dolls are the nicest dolls I've found. I have bought several of them at My Doll Best Friend website, but I bought Vroni from someone who listed her in the Gotz doll group on Ravelry, so pre-loved. There are other places to buy them, but I'm happy with this vendor. There is an additional charge for shipping from the UK, but I feel that the additional cost is worth it, because the dolls end up costing not too much more than you would pay for an American Girl doll, which I don't think is quite the same quality, although they are quite nice. I have bought shoes (glasses, other accessories) from the same place (My Doll Best Friend). Some of the shoes sold by The Doll Clothes Store (here in the US) will fit them. If you call them, they will usually be able to tell you if the shoe you're interested in will fit the doll you want to fit. You can also get shoes and other accessories through other vendors, including Etsy and eBay. Zoey is a Creatology doll from Michael's. I think they have a sweet face, and I love their smile. They aren't very high quality, though. The vinyl in their arms and legs is very thin, and the connections between the fabric body and the vinyl parts are very noticeable. With a coupon, they are almost next to nothing in cost, but I think the best budget doll is a Madame Alexander (like Dolly and Daphne Jr.). They are "Play" dolls or "Favorite Friends." They have cloth bodies, but a vinyl chest plate, which makes them cuddly, but they still look good in clothes with a neckline that doesn't go all the way up to the neck. They are more expensive than the Creatology dolls, but the difference is worth it. No doll is "just" a toy doll. Each one has the potential to be loved...and perhaps to have a life you don't even know about. Peggy, I love the dolls that you have dressed. Where do you get them and where do you get their shoes. The dolls that I have dressed are just toy dolls. I have made dresses and also knitted jumpsuits or sweaters. Rebecca, I don't think of 3.2% beer as "liquor." The Mormon church doesn't like its followers to consume alcohol or caffeine, supposedly for health reasons, but they put sugar in everything. There are lots of overweight people here. I think sugar is just as dangerous as alcohol and caffeine. I try to avoid over-consuming any food or drink. Yes, most restaurants here charge corkage, too. Ah, that explains it. Here in BC we've had very restrictive liquor laws too - probably worse than Utah, if you can believe it. It's relaxed somewhat over the past few years - we now have a few liquor stores that aren't run by the BC Government, but no liquor is of any kind is available in grocery stores. Currently, we can't bring wine across provincial boundaries (unless we smuggle it) which I believe is to protect each provinces wine industries. So although Ontario has a booming wine industry, you can't buy their wine here in BC. I think they're trying to change that though. And just this past year, I believe we can finally take a bottle of wine to a restaurant - and they charge a 'corking' fee to open it for you. Very funny! DH and his brother grew up in Southern California. They both still like to ski. Thank you! I've been to the outdoor show in Sisters a couple of times, but not recently. 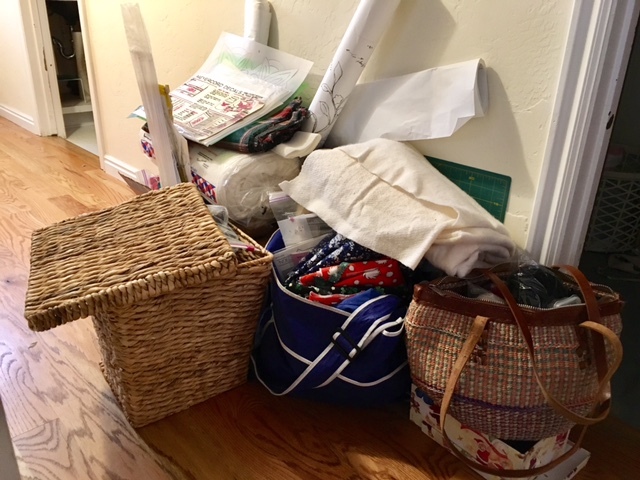 Last time, three quilting friends and I stayed in Bend -- too much hassle to try to stay in Sisters at that time! Good luck with finding the place you need. And, yes, there is snow in Bend, but not as much as Park City, Utah! My late parents, when they were ready to retire many years ago, considered settling in Bend. That is, until my mother subscribed to the local newspaper for a year and noticed how cold it was there in the winter! They were SoCal residents through and through and the fact that it could get below freezing unnerved them! They had only seen it in the summer.